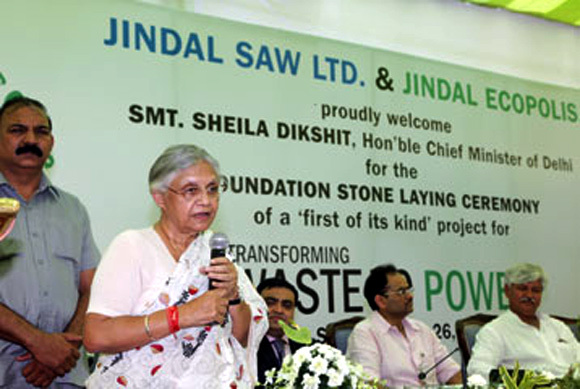 Few issues in Delhi whip people into as much of a frenzy as Jindal's Okhla-based waste-to-energy plant. 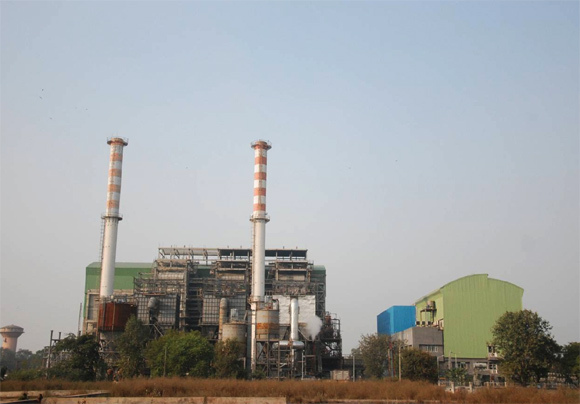 Residents of Sukhdev Vihar in Okhla have been enraged that the plant has been situated a mere 200 metres away from the colony. Layers of ash and soot that blanketed the neighbourhood in December last year only served to turn up the temperature in what has become a bitter dispute. Residents are concerned that the emissions and ash from the plant could severely impair their health and that of future generations. "This is a life and death struggle against a toxic plant," says journalist Ranjit Devraj who is a resident of Sukhdev Vihar. Jindal Ecopolis did not respond to repeated emails and phone calls sent to them over the span of a week. Image: Delhi chief minister at the foundation stone laying ceremony. Are these concerns legitimate or a trifle overblown? According to a representative of GIZ, the development arm of the German government, such plants are strewn all over Europe - a continent that is paranoid about public health risks. In German cities, for instance, they sit squarely in the middle of neighbourhoods. What makes this possible, however, is the fact that incinerator technology has come a long way in just a few decades, say experts. Around 1990, they were likely to cause incidences of liver failure and a wide range of cancer, thanks to the dioxins and furans - poisons released when burning plastic - along with whatever heavy metals (mercury and lead) that are invariably present in mixed waste. 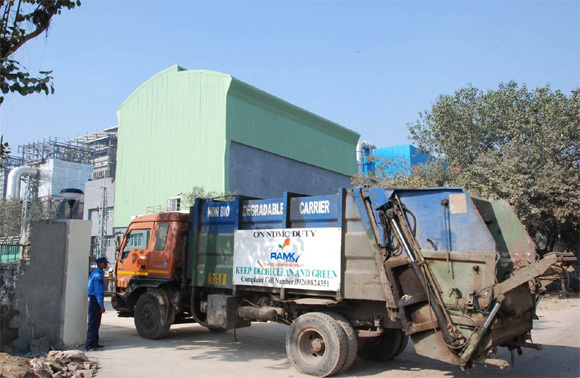 Image: Timarpur Okhla Waste Management plant. These have since been reduced a thousand fold, thanks to new technology. 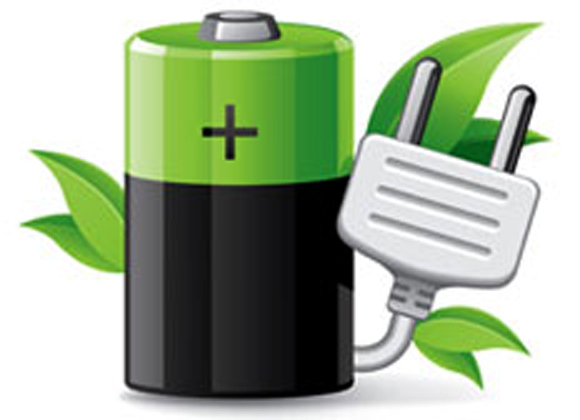 Dioxins and furans are super-heated in order to break their chemical bonds, thus de-fanging them, and the steam that is generated runs turbines for electricity. Finally, heavy metals are scrubbed out and absorbed by filters and carbon powder. The fly ash from this process is further treated to render it harmless. "However, in Germany we learnt our lessons the hard way over thirty or forty years and thousands of demonstrations that forced the technology to improve," says the GIZ representative. So, the big question is, does the Okhla plant have the kind of technology that neutralises poisons emitted from burning waste? The answer to this question is a tangled skein of arguments and counter-arguments made to vindicate or condemn the Okhla plant's specifications by those involved in this fracas. However, a few things stand out. 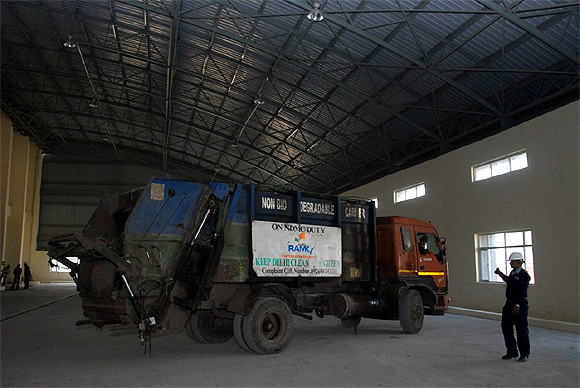 Image: NDMC Truck entering the facility. One, there is, to date, no regulatory body that exists in India that in most other countries would normally be set up to police this relatively new industry - and especially so before the building of a plant. There is also no process to undertake a thorough technology evaluation or comparative technology review. "This is not an ideological issue. These can be potentially very toxic technology," says Ravi Agarwal, a hazardous waste expert at Toxics Link. 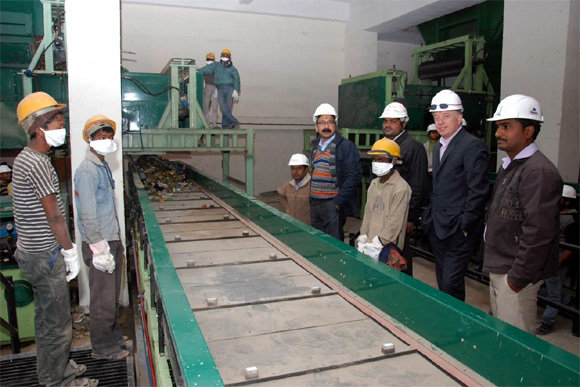 Image: Timarpur Okhla Waste Management Company. 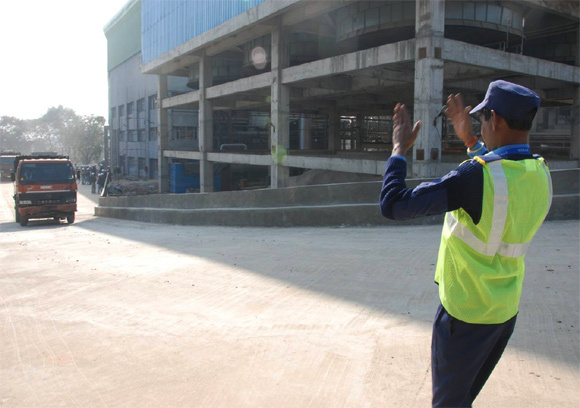 Photographs: NDMC Truck carrying MSW entering the facility. 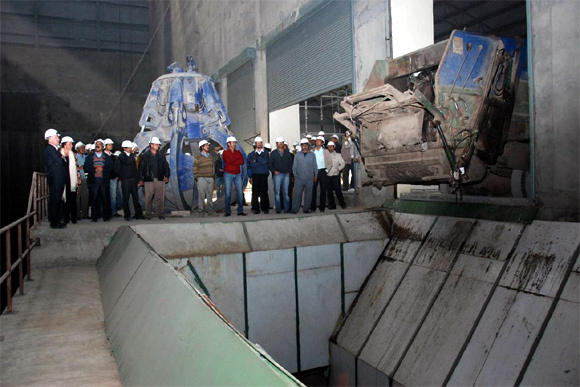 Critics of the plant say that the original proposal for it - when it was owned by IL&FS, which subsequently sold the enterprise to Jindal Ecopolis - was for a technology called refuse derived fuel (RDF), where waste is compressed into dense pellets, boosting its calorific value, thus helping it burn better. Indian waste, being low on the calorific scale, needs something like this, say waste experts. When Jindal took over the plant there was a change in specifications - which, critics say, required a new clearance from the Ministry of Environment and Forests that Jindal allegedly didn't get. Instead of RDF, the plant was now using boiler technology, sourced from a Chinese company, that would first dry the waste and then burn it, which the company claimed was equivalent to RDF. Critics claim that not only is the technology cheap, the efficacy of these kinds of boilers is not known in Indian conditions. While Jindal Ecopolis didn't respond to queries on plant costs, this much could be ascertained: A state-of-the-art, plasma-sealed plant in Europe or the US costs around $500 million to build, while the bill for the Okhla plant was somewhere in the neighbourhood of $30 million, according to the initial IL&FS project documents obtained by Business Standard. Some things, however, turned out to be unequivocal. The Central Pollution Control Board (CPCB ) had put together a 'Technical Evaluation' of the project in 2011 which comprised of representatives from Jindal Ecopolis, IIT Delhi and GIZ amongst others. Image: NDMC truck ready to unload the MSW. According to a copy of the report obtained by Business Standard, Dieter Mutz and Raghu Babu from GIZ said that "more transparency is required in addressing environmental and health issues...expected emissions of dioxins and furans too are not quantified." Neither was the ash tested for toxicity. Furthermore, the committee members as a whole felt that the promoters had exhibited "failure to address technical issues", but would be given one more chance to sort things out. Another meeting was held but the results were inconclusive. Things came to a head when the case, after going through 22 hearings in Delhi's High Court, was punted to the National Green Tribunal (NGT). Recently, an expert panel was appointed by NGT to oversee investigations into pollution caused by the plant. Image: irst consignment of MSW being unloaded at the facility as officials look on. The panel was made up of 6 members which included J S Kamyotra, head of CPCB, Sandeep Mishra, head of Delhi Pollution Control Committee (DPCC) and U C Bahri, a technical expert representing Sukhdev Vihar, amongst others. In March-end, the team made a surprise inspection visit to the plant in and conducted a battery of tests. This is what they came up with: The level of dioxins and furans in Boiler Stack 1, against a permissible limit of 0.1 (in ng TEQ/NM^3) was a staggering 12.413. In Boiler Stack 2, that level was also way above the 0.1 level at 2.758. "These are some of the most poisonous substances known to man," says scientist Bahri who was a member of the expert panel. 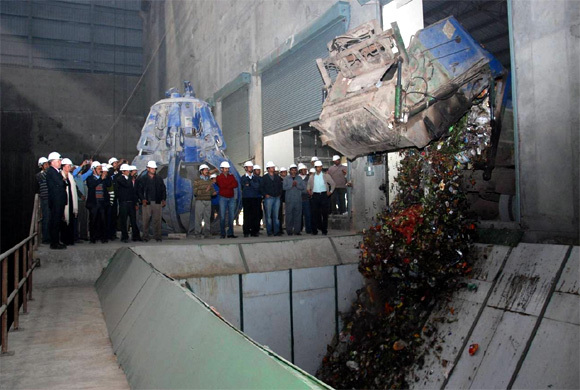 Image: The waste being transferred for segregation process. "They leach into the soil, water and poison the entire ecosystem. In the US or Europe, the plant would be condemned and shut down immediately," he adds. While it is unclear as to what the Tribunal will ultimately decide regarding the future of the Okhla plant, the dioxin levels from those tests have suddenly cast a long shadow over other waste-to-energy projects in India. After all, two more plants are springing up in the Delhi vicinity - in Ghazipur, and along the Narela-Bawana road. The Rs 1.5-crore-a-megawatt subsidy that the Ministry of New and Renewable Energy coughs up for these plants will ensure that there will be more proposals for them, especially if you factor in the lure of carbon credits. 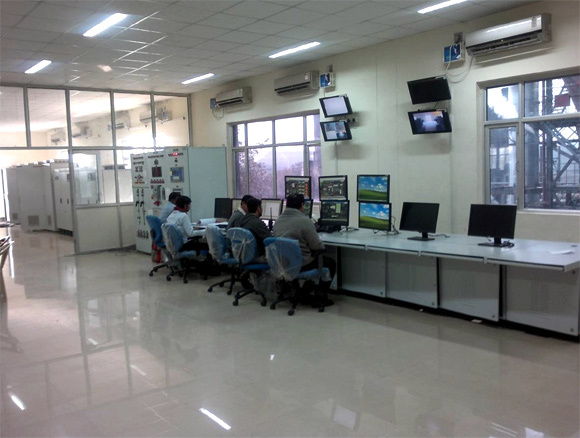 Image: Online montiroing being done at the facility. However, the undeniable fact is that India's sky rocketing land prices and accompanying health concerns make landfills increasingly untenable as a waste management solution. "What is the solution for Delhi? Can you escape incineration? I would say you can't," says GIZ's Mutz. Curiously, though, not a single one of these plants - in Timarpur, Hyderabad, Vijaywada, Lucknow and Chandigarh - have run successfully and all have shut shop, suggesting that emissions and dioxins are not the only hazards that lurk for waste-to-green projects. Image: Hazards lurk for waste-to-green projects. 15 STUNNING photos from the week that was!